It seems every newspaper carries a mandatory image of twins or triplets or even better quads in school uniform, as they head to school for their first prep year. It reminds me of our own front page photo of the men-children some 10 years ago (that’s it pictured for you) which was pretty exciting at the time, and really is a great moment to have captured for posterity. 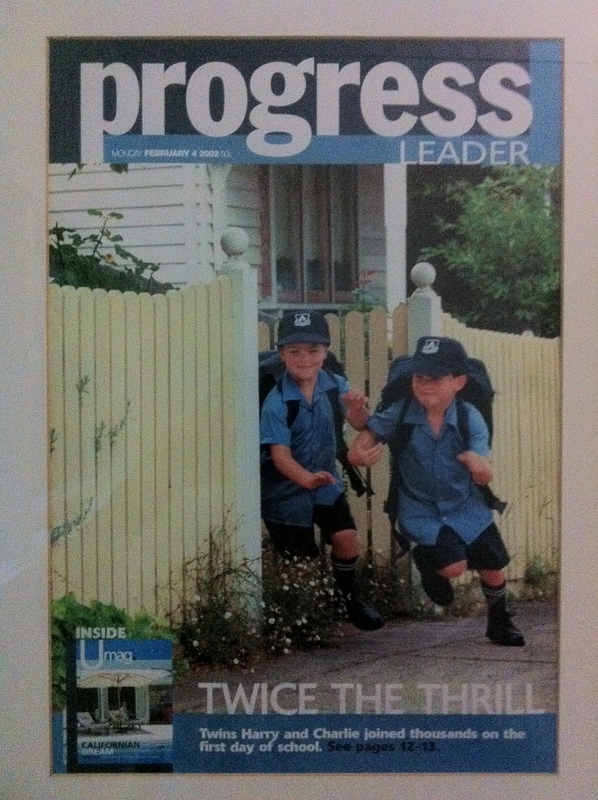 I still remember the boys wearing their school uniforms home from the store, such was their thrill at owning one. And of course the pride I felt whilst blinking back tears as we stood in the prep classroom and launched them on their school journey. No less joyful was repeating it all 7 years later with our daughter. They are moments you could relive a thousand times over and each would be as wonderful as the first! In contrast to the boys, Sister of a Man-Child’s excitement was palpable at entering Year 3. She even sent me a text message yesterday when she got home “Hay (sic) mum first day of school great. Thumbs up”, complete with thumbs up images! Now before you think our 8-year-old daughter has a mobile phone, not quite. For Christmas she was lucky enough to get an iPod Touch (as a modern-day alternative to the Nintendo DS). Whilst most people would think she would use it for music, it comes with so many other features she’s barely had the earphones on. Why would you when it also has countless games free from the App store, a camera better than mine, access to YouTube, and most importantly the ability to text (via iMessage) and use Facetime with other iPhone/iPod users. The ONLY thing it doesn’t do is make phone calls – seriously. So when Ruby’s in a wireless environment, she’s practically got her own iPhone. A “Digital Native” in the making! She recently found some friends with iPods or iPhones, and now they’re madly texting each other and doing Facetime. The only issue is that Ruby doesn’t have her own email address, so she’s using one of mine. As a result, all her messaging appears automatically on my phone too. It was fascinating to observe the conversation unfold between three young girls, and see them helping each other text and use Facetime. And then installing Emoji (an app for texting icons). Now they seem to send each other hundreds of smiley faces and other images. Although the other morning I was sitting at work with a stream of messages (complete with sound notifications) going off at my desk which got a little out of hand. I ended up joining the conversation and asking them to stop, which took a while because we had to convince one of the girls that it really was the “Mother” texting. Not surprisingly, we have now banned the use of the iPod before school and not until after homework is done in the evenings – like all fun and highly addictive “toys”, good in moderation.